Global Travel Media » Blog Archive » SkiJapan.com 2018/19 brochure for forthcoming winter !!! SkiJapan.com 2018/19 brochure for forthcoming winter !!! an 18-room hotel, with tour operations and onsite services in the absolute heart of the Happo Resort Area in Hakuba Valley, within easy walking distance to the closest chairlifts and the many nearby restaurants, bars and local services. We are really excited to expand our ski and snowboard tour operations and a presence in the Hakuba Valley. 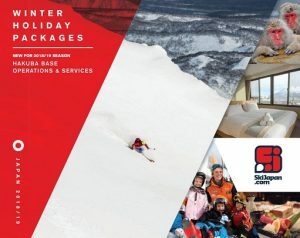 “Our team will provide guests with the same excellent service that SkiJapan.com has offered in Niseko for over 20 years. The Hakuba Valley and other Honshu resorts such as Shiga Kogen, Lotte Arai, Myoko Kogen, Nozawa Onsen and the lift-connected Naeba and Kaguru Resorts are gaining more and more interest each year, with their amazing selection of trails and terrain, unique cultural experiences and the proximity to Tokyo.”said Belinda White, SkiJapan.com’s General Manager. The consultants at SkiJapan.com offer a wide selection of accommodation options in the popular and emerging resorts of Japan’s main island Honshu and the very popular north island of Hokkaido with some great Early Bird deals on a range of accommodations still available. There’s also an Early Bird Special, with *Free Kids Rental or 15% off Kids Rentals (*conditions apply) from its NBS outlet in Niseko and the new Hakuba Gateway outlet in Happo, in conjunction with every accommodation/land package. This offer is valid until July 31st for Niseko bookings and until 31st August for Hakuba. Contact SkiJapan.com for full details and bookings.